NEW VERSION – All SMD components come pre-soldered now. 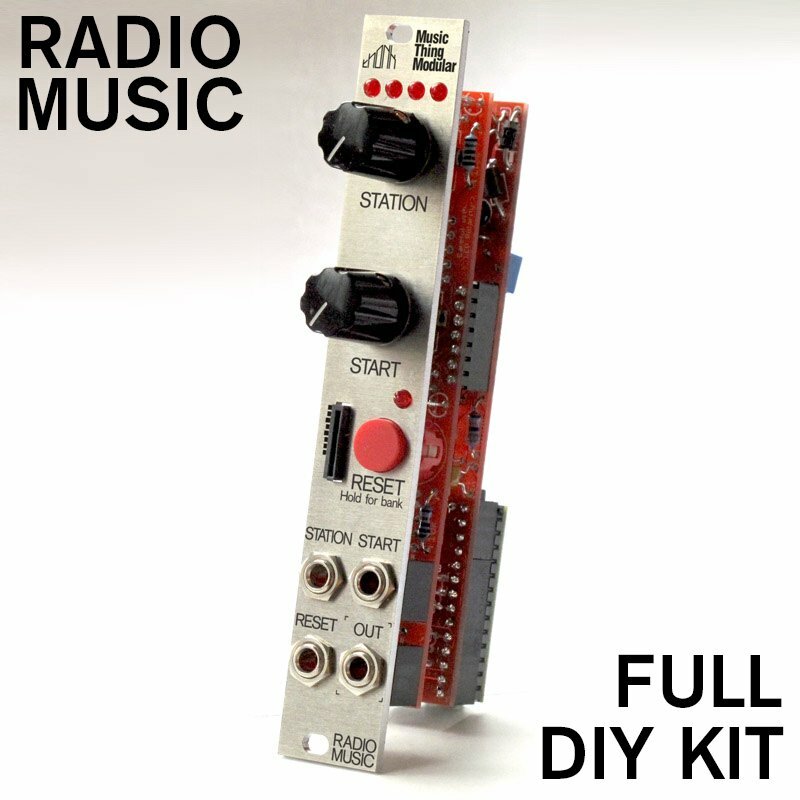 The RF Nomad is a voltage-controlled shortwave radio receiver module in Eurorack format. 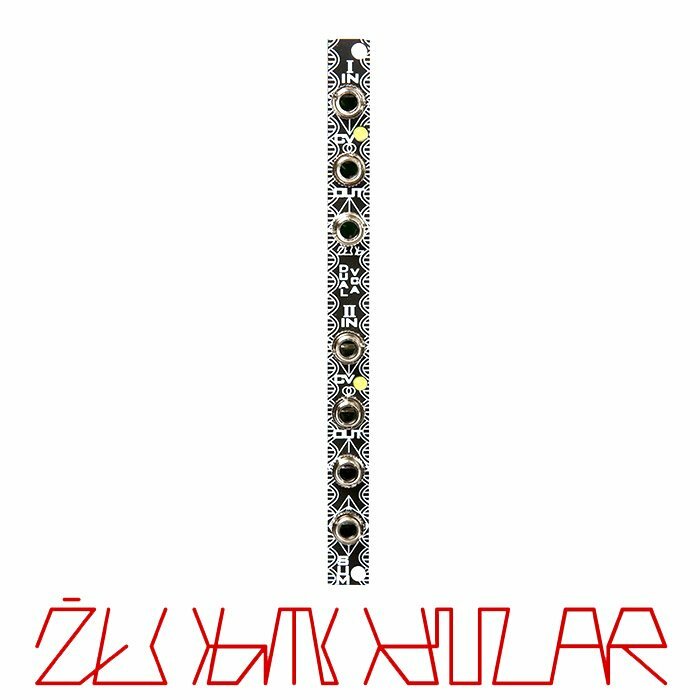 The RF Nomad allows you to use radio frequency noise and signal sources as new sonic territory for exploration as audio sources for your modular synthesizer. The module is a direct-conversion radio receiver, which tunes to frequencies from approximately 9.6 to 10 MHz and decodes the audio as single sideband. Various RF noise generators, such as computers, appliances, etc., as well as shortwave broadcasts and ham radio stations, can be decoded and used as useful and interesting sound sources. The RF Nomad’s tuning can be varied under voltage control, allowing LFOs, envelopes, and even audio sources to modulate the tuning parameter in real time. 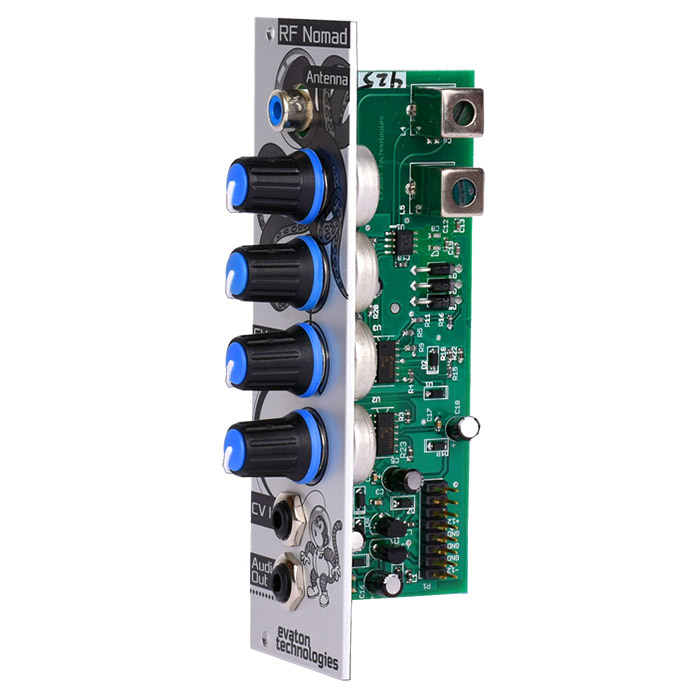 In short, the RF Nomad puts those classic squelchy, squealy, hissy sounds of a shortwave radio into your modular! Shortwave reception is a bit finicky by nature; radio waves travel around the world subject to atmospheric conditions, terrain, elevation, and surroundings. Here are some tips to help you get better reception. Time of Day. Atmospheric conditions vary throughout the day. Experiment with listening at different times of the day to see when is the best time of day for your location. In Pittsburgh, mid morning and late afternoon seem to work well. Folks in London have reported good results after midnight. Antenna. The supplied antenna is useful, but a longer antenna is always better. The included antenna is just a length of wire; if you strip the end of the wire and solder on a much longer piece of wire, reception will improve. Just be sure to insulate your solder joint with some tape or heat-shrink tubing, to protect against contact with live circuits. Elevation. The higher up you are, the better. If you are in a valley, or on the side of a hill, the local terrain may be blocking signals. Building materials. If you are inside a building, the metallic portions of the building materials may be blocking your signal. Try to run the antenna near an exterior wall, or out a window if possible. If you are in a basement, try moving to an upper story. Sunspots. Yes, the 11-year sunspot cycle affects radio wave propagation a great deal. During periods of low solar activity, the atmosphere is not very ionized, and radio waves do not reflect back down from the upper atmosphere as well. Sunspot activity also varies from one day to the next, so there may be better days than others. Most off the shelf shortwave receivers are AM (amplitude modulation) receivers, which suppress the carrier signal. From my ham radio experience, though, I know that if you listen to shortwave frequencies with a sideband decoder instead of an AM decoder, you hear the carrier signal as well as the audio signal, which I feel is far more interesting as a sound source for a synth than just the plain audio alone. It’s the bit that gives you those searing heterodyne squeals. So, it was decided to go with a “direct-conversion” receiver design, which receives both sidebands plus carrier. Normally, one doesn’t think of a direct conversion receiver when trying to design a modern receiver, because they are very crude. But, in the case of the RF Nomad, crude is exactly what we want! 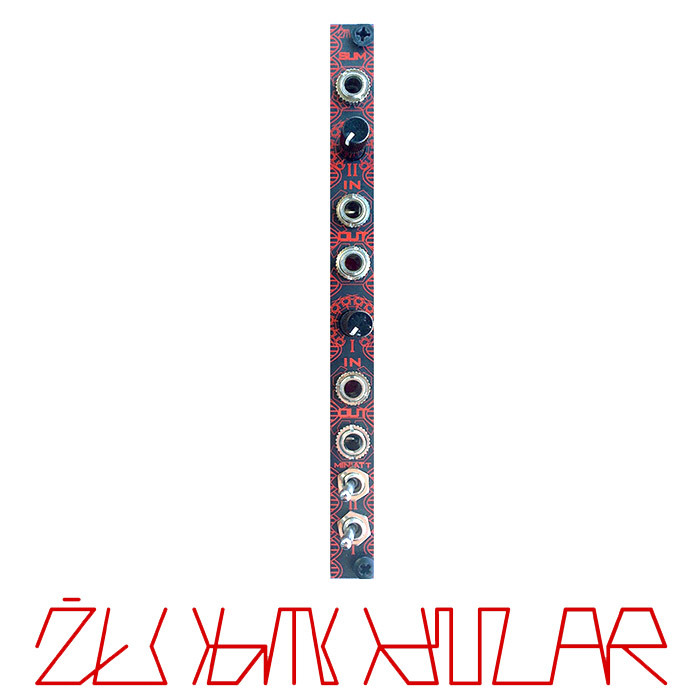 It’s gives more squeals, more hiss, more heterodynes, more brutal nasty sonic goodness! The limitations of the direct conversion receiver become an asset for us synthesists. 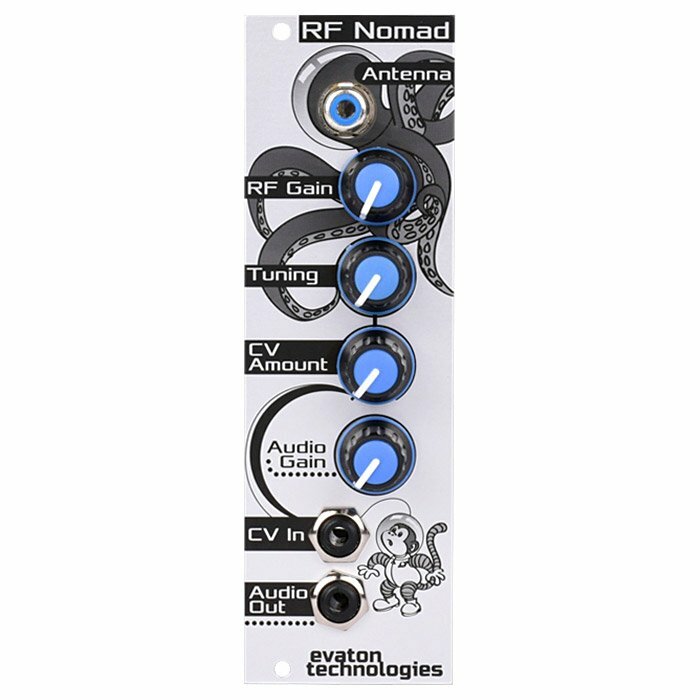 What’s neat about the RF Nomad is that the tuning is 100% analog, and is voltage controlled. In fact, the “Tuning” knob on the front panel is just a potentiometer that applies voltage to the tuning circuit. The CV input allows a bipolar signal to raise or lower the tuning. In technical terms, there’s a summing amp that adds the CV amount (plus or minus) to the Tuning amount. The upshot of this is that you can alter the tuning with the CV input, like it’s a remote control for the tuning knob. Apply an LFO, and the tuning slowly increases and decreases. Attach it to a sequencer, and you can cycle thru stations, or just cycle thru different pitches of squealy heterodynes. 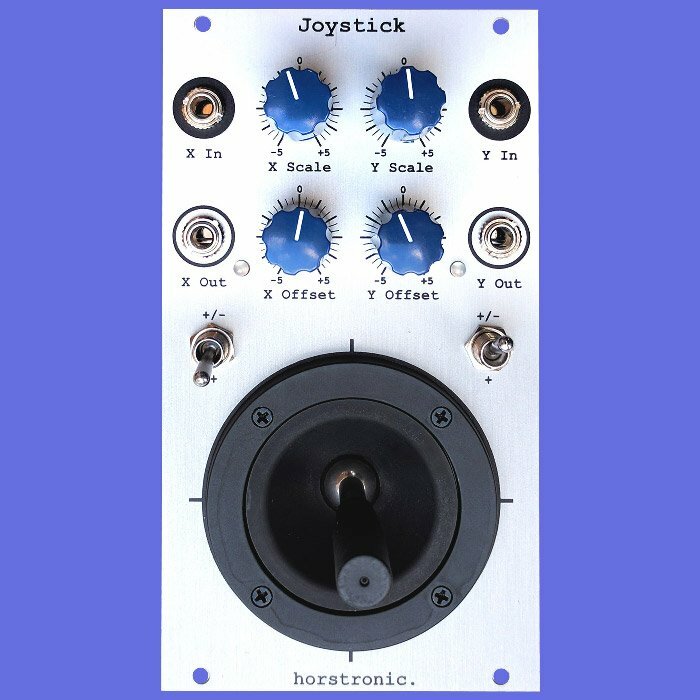 Hook it to an envelope generator and get on-demand heterodyne swoops. Hook it to an audio-rate LFO, and now you get freaky FM effects. Really cool if you happen to be receiving a strong station — it’s awesome hearing what that does to broadcast voice stations. Oh, yeah, something else — because the RF Nomad is a direct conversion receiver instead of an AM receiver, if your tuning is off-frequency, the audio of the received station is shifted in frequency, too. Kind of like running the audio thru a ring modulator. So you can take your stately radio announcer and make him sound like a duck talking, just by tuning a little off-center. The RF Nomad makes a great “coloured noise” source. Check out http://www.soundcloud.com/rh2y for some demos of using the RF Nomad as a percussion noise source. The Nomad tunes roughly 9.6 to 10.0 MHz, which is most active late afternoon to early evening (in the USA), though your mileage may vary. If you can’t get a strong station, you can try extending the antenna (just clip another length of wire onto the end of the supplied antenna). Or, find some old electronics, and drape the antenna over it. Stuff from the 80s/90s era — Commodore 64’s, PC AT’s, game consoles, etc. The EMI generated by these devices makes for some interesting sonic material. Let’s see.. am I forgetting anything? Oh, yes If you do want to simply “listen” to shortwave on the Nomad, you’ll want a bandpass filter after it. The output is 100% UN-filtered, to allow you to have plenty of material to feed your favorite filters with. But that makes actually *listening* to the radio a bit grating on the ears. Fun fact — the output of the Nomad can be fed back into it’s CV input for some self-modulation fun. Patch the output to a multiple, and then feed one signal from the multiple back into the CV input. Or, patch the output to a filter, and then to a multiple and into the CV input, to take some of the noise out of the loop. Also — the Nomad’s CV input is bipolar — if you input a negative voltage, it will decrease tuning from the setpoint selected by the Tuning knob. If you input a positive voltage, it increases. However, there is a maximum and minimum tuning value that is attainable, so if you put the tuning knob all the way CCW, inputing a negative CV will not lower the tuning any further. Likewise on the high end. You can, however, use this to your advantage: This lets you “clip” the incoming CV signal — if you input a pure sine on CV, but tuning is near one end of the range or the other, it clips to the max or min, and so, effectively, your CV is flattened on one side or the other. If the CV is a slow LFO, this makes for a neat repeating sequence with a pause in it! At audio rate CV, it sounds a bit wave-shapey. Finally, because the Nomad is a direct-conversion receiver, warts and all, one of those warts is that it is slightly drifty with temperature. I’ve done about as much as I can to reduce the driftiness, but you will notice that over several minutes it will wander around just a little bit. I felt this was an acceptable trade-off, as the true talent of the Nomad is how well it responds to a quickly changing CV input to generate quirky sounds.